The BBC will live stream all its highlights programmes when the new English Premier League season starts. The online coverage means Match of the Day, Match of the Day 2 and the Sunday repeat of Match of the Day will all be streamed live online as of Saturday 11 August. 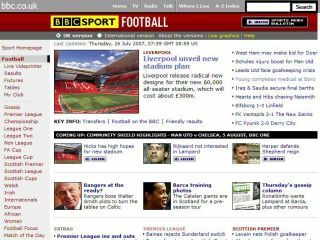 The news was detailed in a press release to mark the start of the BBC's coverage for the new season. The BBC's Football portal will carry on hosting its regular columns from Alan Hansen, Mark Lawrenson, Garth Crooks and Lee Dixon. And it'll add columns from two Premier League footballers and Plymouth Argyle manager Ian Holloway.